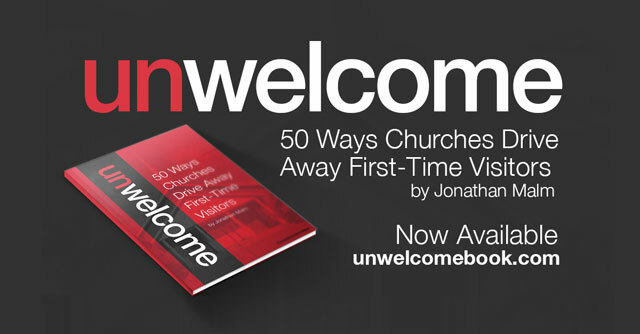 Last fall we started collecting Church Visitor Horror Stories to celebrate our book, Unwelcome: 50 Ways Churches Drive-Away First-Time Visitors by Jonathan Malm. It’s been scary stuff. But hopefully we can learn to be more welcoming. For an assignment in college, I needed to attend a predominantly black church in an urban area. I checked the church’s basic website, noticed they had two service times, and like any college student chose to attend the later of the two. What the website failed to point out is that one Sunday a year is Ministry Sunday, when the entire church comes for an extra long service that begins at the normal early service time, continues through the middle Sunday School hour and ends at the conclusion of the second service. When I showed up 15 minutes early for the second service, I walked into a church service that had started three hours earlier and still had two hours to go. The only seat in the room was up front in the choir. As a white young adult in khakis, I stood out very awkwardly amidst an all-black choir dressed in full choir robes. I spent the entire rest of the service sitting with my face toward the congregation. Whenever the choir stood to sing, I awkwardly sat next to them not knowing the words. The five-hour service might be a bigger problem, but we’ll let that go. Running out of seats is a good problem to have, just be prepared. Any time your worship services will vary from the norm, you need to shout it from the rooftops. Make sure potential visitors know what to expect. It’s also important to have overflow seating. Running out of seats is a good problem to have, just be prepared. Just about anything would be better than seating a visitor with the choir. Have some extra chairs available and know where to set them up. Especially if you’re having a combined service you need to be prepared for an overflow crowd. If there’s absolutely nowhere else for someone to sit, it’d be great to see a regular member give up their seat for the visitor. At least the regular member would feel less awkward sitting with the choir. For more terrors, check out our other Church Visitor Horror Stories. Actually experienced this recently. “Insiders” knew about the time change but none of the church information outlets (website, outside sign, social media) reflected the changes. Drove 2 1/2 hours to visit. I wasn’t happy.